Honey is more effective in treating difficult-to-heal wounds than antibiotics, says Jennifer Eddy, a professor at the University of Wisconsin School of Medicine and Public Health. Even methicillin-resistant Staphylococcus aureus, the so-called flesh eating bacterium is no match for the antibiotic compounds the bees manufacture for us - for free. Meanwhile, antibiotics are losing much of their appeal as many common bacteria develop resistance. Chickens are fed grains mixed with antibiotics, calves and pigs are routinely injected as a "precaution". Pharmaceutical companies are pushing antibiotics as the solution to all health problems in animal husbandry. We eat the residues of these antibiotics in many of our foods, and of course bacteria, being exposed to the drugs at every turn, find ways to resist their deadly properties. That resistance is getting more and more problematic as hospitals become a breeding ground for infections. "During the 1918 Spanish Flu epidemic, my dad was a little boy, 8 years old, in Stockton, California. His dad was a beekeeper, and kept some filled honeycombs in a closet in the house. During the epidemic, the family members would go into that closet and eat some of the fresh honey every day, whenever they wanted. The flu decimated the population of Stockton, including the families of their neighbors. Next door, only one little boy survived, and when he came out of the house, they couldn't recognize him, he was so emaciated. Other whole families were entirely wiped out. They piled corpses in the streets, as there weren't enough healthy men to bury them. Dad's (large) family escaped the flu intact. It skipped their house completely. Dad always said he thought it was something in the honey they ate that protected them. He may have been right. I recently read that they've discovered that honey has a compound that turns into something like hydrogen peroxide inside you. For whatever it's worth, this gives some protection from viruses." Most tantalizingly, honey seems capable of combating the growing scourge of drug-resistant wound infections, especially methicillin-resistant Staphylococcus aureus, or the infamous flesh-eating strain. These have become alarmingly more common in recent years, with MRSA alone responsible for half of all skin infections treated in U.S. emergency rooms. So-called superbugs cause thousands of deaths and disfigurements every year, and public health officials are alarmed. Professor Molan has shown that honey made from the flowers of the manuka bush, a native of New Zealand, has antibacterial properties over and above those of other honeys. Positive findings on honey in wound care have been reported from 17 randomized controlled trials involving a total of 1965 participants, and 5 clinical trials of other forms involving 97 participants treated with honey. The effectiveness of honey in assisting wound healing has also been demonstrated in 16 trials on a total of 533 wounds on experimental animals. There is also a large amount of evidence in the form of case studies that have been reported. It has been shown to give good results on a very wide range of types ofwound. It is therefore mystifying that there appears to be a lack of universal acceptance of honey as a wound dressing. It is recommended that clinicians should look for the clinical evidence that exists to support the use of other wound care products to compare with the evidence that exists for honey. Honey has a very broad spectrum antimicrobial activity. It is effective against most species even when diluted 10-fold or more. Glucose and oxygen, in the presence of glucose oxidase, produces gluconic acid and hydrogen peroxide. Manuka (Leptospermum) honey is unique in its non-peroxide antibacterial activity. It is found that mixture of Honey and Cinnamon cures most of the diseases. Honey is produced in most countries of the world. Ayurvedic as well as Yunani medicine have been using honey as a vital medicine for centuries. Scientists of today also accept honey as a "Ram Ban" (very effective) medicine for all kinds of diseases. Honey can be used without any side effects for any kind of diseases. Honey is known to have anti-inflammatory properties and case studies have demonstrated its usefulness on non-healing wounds. A laboratory study on the effect of honey on cells implicated in prolonged inflammation demonstrated that the honey was able to modulate the activity of monocytes to release growth factors and anti-inflammatory agents, although how this is achieved is not yet understood. Singers have long used honey to soothe their vocal chords. Dieters use it instead of sugar because it satisfies their sweet tooth and keeps them full longer. Even the Quran lauds the salubrious effects of honey. "And thy Lord taught the bee to build its cells in hills, on trees, and in (men's) habitations; There issues from within their bodies a drink of varying colors, wherein is healing for men," says the passage, written 1,400 years ago. Researchers in Manchester, England are treating mouth and throat cancer patients with honey, seeing if it will reduce their chances of contracting bacterial infections, especially ones that are resistant to antibiotics. Honey has been shown to have an antimicrobial effect against many bacteria and fungi. Using honey to treat wounds is nothing new; even ancient civilizations used it in this manner. However, this is the sort of thing that usually gets relegated to "folk healing". It seems scientifically obvious: honey is very acidic (antibacterial), and it produces its own hydrogen peroxide when combined with the fluid which drains from a wound! The extremely high sugar content of honey means it contains very little water. So, it draws the pus and fluid from the wound, thereby speeding the healing process. Furthermore, the honey contains powerful germ-fighting phytochemicals from the plants that produced the pollen harvested by the honeybees. Having already been accepted by the overseas mainstream medical community for some time, North America finally caught on. In the abstract, if one reads between the lines, it says in as polite and scientific a language as one can generally get away with in such a milieu, "why the heck are you ignoring this?" Some clinicians are under the impression that there is little or no evidence to support the use of honey as a wound dressing. To allow sound decisions to be made, this seminar article has covered the various reports that have been published on the clinical usage of honey. Positive findings on honey in wound care have been reported from 17 randomized controlled trials involving a total of 1965 participants, and 5 clinical trials of other forms involving 97 participants treated with honey. The effectiveness of honey in assisting wound healing has also been demonstrated in 16 trials on a total of 533 wounds on experimental animals. There is also a large amount of evidence in the form of case studies that have been reported. It has been shown to give good results on a very wide range of types of wound. It is therefore mystifying that there appears to be a lack of universal acceptance of honey as a wound dressing. It is recommended that clinicians should look for the clinical evidence that exists to support the use of other wound care products to compare with the evidence that exists for honey. Great site with some very interesting articles. 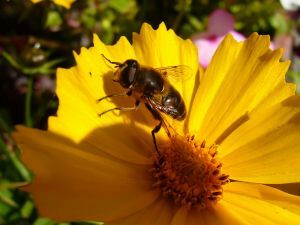 In case you'd want to know... that is a hover fly in the flower photo, not a honeybee. honey is great but if your just talking about a wound you can put dettol(chloroxylenol) or iodine on it: it kills everything. Antibiotics are for internal use and you can't go injecting people with honey can you? This is a great collection of info. and have enjoyed reading it. Although, Mike is correct. That is a type of fly and definitely not a honeybee. In 1973 my girlfriend spilled hot cooking oil over all of the back of her hand when the fry pan with the loose handle allowed this to happen as she was transporting the pan with frying food. She immediately developed 2nd degree burns as we were preparing ice water to immerse her hand in. The cold water controlled the pain. Later, after drying the hand, I dried the hand, lanced the blisters, and spread honey over the hand and rolling a bandage over all of the hand. Keeping the air off of it controlled pain, too. The next day we started a scheduled one week camping trip. We changed the dressing when honey eventually would soak through it. After the trip, a doctor looked at her hand and was very surprised at the rapid recovery and condition of the hand. The only mistake we made, was not to allow the hand access to more air drying time between change of dressing, just as you would not want skin to be immersed in water for extended days (remember WW I soldiers in trenches who got "trench foot?"). We have also used honey on sunburns which speeded skin recovery and even prevented peeling. Yesterday, she (now my wife and age 62)) developed a small but impressive wound on her elbow after falling on a sidewalk she was jogging on. Her friend with her took her into a nearby hair dresser's shop and thoroughly cleaned the wound and used hydrogen peroxide. Once home, I spread honey on it and bandaged it. The honey is from a local bee keeper who does not use heat to extract the honey from hive's frames. This preserves the enzymes that promotes tissue and skin healing. From what I have read recently, it may be helpful not to "smoother" the wound, but to use sufficient amounts to leave a light layer of honey over the wound considering the dressing absorbing some of the honey. We will change the dressing twice per day both for the "airing and drying" but also to monitor for healing progress. I first learned about the amazing properties of honey when I was half way through high school in the 1960's with facial acne. My mother got me off of cane sugar and products that contained it, and reduced my fatty food intake that teenagers tend to eat. She allowed me to use honey to address my sweet tooth urges. I washed my face a number of times each day. My face cleared remarkably in a week and a half. Her resource: Gaylord Hauser, a popular nutritionist author published in the 50's and 60's. I got into his books after my face cleared. He discouraged cane sugar and promoted honey. He described some amazing properties about honey, including perfectly eatable honey found in the tombs of the Egyptian pharohs. At age 61 I have had a wonderfully healthy life that includes between one and two pounds of honey consumption per week. I promoted my father's health from severe hayfever by getting him to eat local bee keeper's honey and pollen before spring. This enormously mitigated the wind borne pollen aggrivating cause of allergies. In my opinion, there is a big difference between locally produced honey gathered from bee keepers who do not use heat nor filters to extract honey. This preserves the enzymes and the amazing healthful properties of the pollens. In full disclosure, I am not a bee keeper or in anyway connected with the industry. I am not in the health care business. I have promoted the healing benefits of honey and byproducts to friends over the years. The evidence is overwhelming for such an inexpensive, healthful food. I have enjoyed reading interesting articles on your website. May be you can check out my blog, too. Hey I like honey a lot of good uses for it. It's a great ingredient for some home health remedies. Very interesting. I've always known that honey was a food of many medicinal properties, but I never knew it was this powerful. Glad to find so many uses for such a great thing from nature! Great! Call me a believer in honey as from now. I tried it on my lip and I have reason to believe it was responsible for healing my lip in no time, as I experienced excruciating pain before I used it and, in no time did it clear up and left me an astounded believer in the use of honey to heal wounds! Try it too, and see what I mean. Afterall, it costs peanuts to get it!